Pretty much does what it says on the tin. No topography, no labels, no lakes. Just a big, zoomable map covered with all the roads in the lower 48. We think it's beautiful. It includes a large number of "products" (all free, all in the public domain), including very high resolution GIS data of roads, political boundaries, school boundaries, etc. 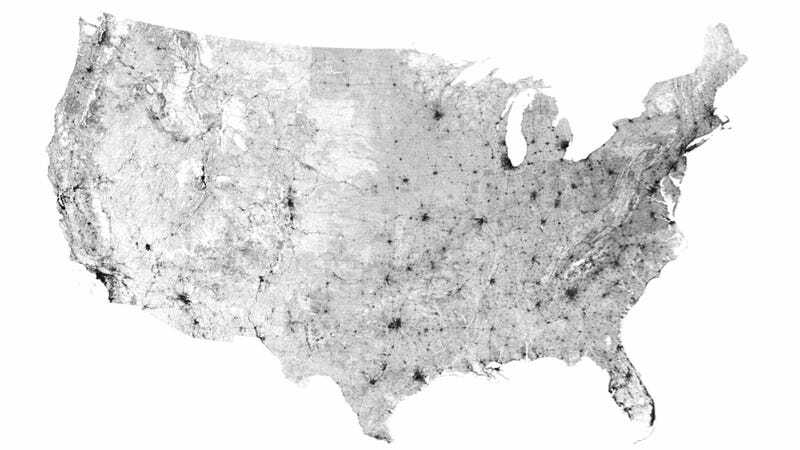 The data I rendered is the county road data (called "all streets" or "all roads"). I basically created a huge picture, then had a program draw a line where the Tiger data said each road is. Downloading, manipulating, and rendering the data is nontrivial. No kidding. It's also damn awesome to look at.